This place has a terrific atmosphere going for it. Described on their website as an “elegantly casual Italian trattoria,” Rosso Trattoria Italia was started in 2009 by one of the co-founders of Mr. Friendly’s. This is the same group that introduced the Columbia, SC restaurants Gervais & Vine and Solstice Kitchen. So, in our humble opinion, they know what they are doing. The location of the trattoria, defined as an “Italian-style eating establishment, less formal than a ristorante, but more formal than an osteria,” is tucked away in the far back left corner of Trenholm Plaza off of Forest Drive. It may be hard to view from the street, but after you go there for the first time, it will stick out like the beautiful succulent orange-tinted lobster does on this plate. It will be an unforgettable dining experience. This Wood-Grilled Lobster Dinner came as a special that is only offered on certain nights (hint hint we think it may be Mondays) and was accompanied by a delicious glass of Pinot Grigio. With the special you also receive a fresh salad before the entrée. 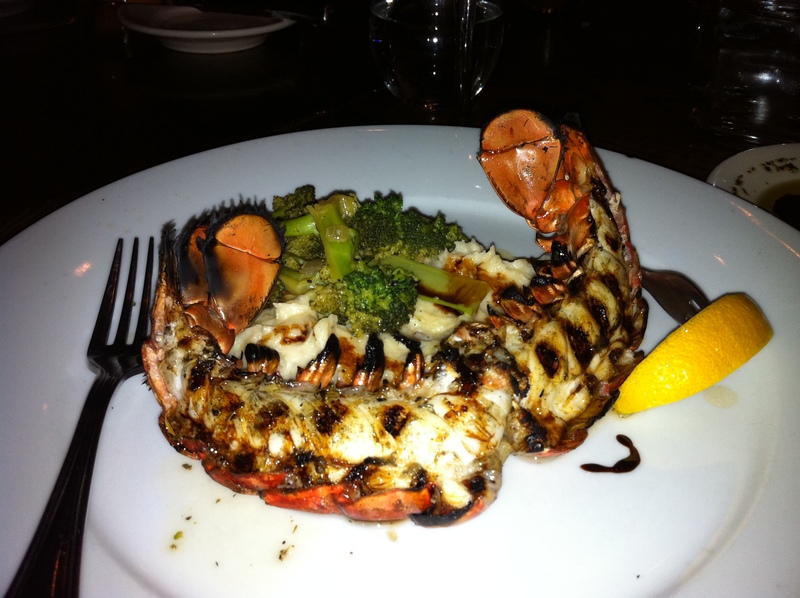 The lobster special comes with a side of delectable broccoli and mashed potatoes. 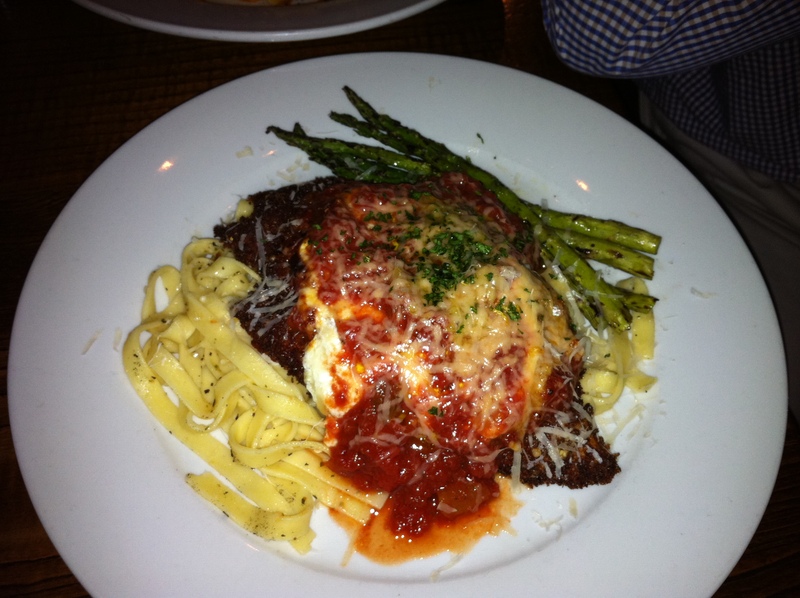 Luckily we dined at Rosso with a fairly large group so we were able to sample many dishes. About half of our group of eight couldn’t resist the thought of Wood-Grilled Lobster Dinner, but the rest of us sampled some of the more common items on the menu, including the Prosciutto con Fichi, or “prosciutto with figs.” A quick Italian lesson: Prosciutto is simply the Italian word for ham, but those living outside of Italy usually associate the word with a specific type of cure for ham. This wood-fired brick oven pizza was simply topped with prosciutto, goat cheese crumbles and fig puree. Yep. Fig Puree. Can’t say I had had the pleasure of tasting that before. But actually as it turns out, figs are crazy good for you and the puree can be used as a fat substitute in cookies and other baked goods. Next up is the classic chicken parmigiana , something you can never really tire of. The panko crust was crispy and evenly fried, giving the slab of chicken a terrific texture. Disappointingly, the flavor of this dish didn’t stand out. It was good, but not what was expected after such appetizing appetizers (fried calamari and steamed mussels). Also, work on your pasta twirling technique before dining here. These noodles are a bit larger than your typical linguini style and they didn’t seem to want to cooperate, leaving your mouth slightly disappointed and a bit agitated after every fork-full reaches the mouth with half of what you intended. I think maybe an Angel Hair Pasta or simple Spaghetti might have been a bit better. However, the asparagus were quite easy to handle, and they were quite good! Now on to the appetizers (hey, but your supposed to do appetizers first!)! We had the pleasure of sampling the calamoro fries and the steamed black mussels. Both were very appealing. The fried strips of calamari were crispy and flavorful when sprinkled with lemon and diped in marinara. The mussels were a real treat too, but please serve some bread with this next time (talking to you, Rosso!). The briny goodness that the mussels were swimming in would have been divine had we been able to mop it up with a few crusty pieces of bread, and please don’t expect us to save the complementary bread for our appetizer, it’s just way too hard to resist. Rosso is a worthy new addition to the Forest Acres area and the memory of our meal will surely bring us back for a second tastes. Until then, try it out yourself! Check out Rosso’s website here and be sure to look at the menu (don’t be intimidated by the Italian, just google translate!) for a preview of what awaits. Looking for a Fine Dining Columbia, SC Restaurant or Romantic Columbia, SC Restaurant? You found one. I went to their website to check it out (based on your delicious review)! You made a statement ‘The mussels were a real treat too, but please serve some bread with this next time (talking to you, Rosso! )’, if you view the pictures on the website, it does show the mussles with crusty bread!! I think you may have been neglected on this dish. Mikki, thanks for checking up on that! Looks like we have an excuse to go back and see .